Please meet Caleb Perdue, Customer Success Associate for National Speed’s Wilmington location. If you’re a current customer, then you’ll have the pleasure of chatting with this ultra-high-energy guy, and also see his pictures & videos of your car on our social media channels. Caleb grew up in Maryland, but spent his most recent years working for SubiSpeed – FT86SpeedFactory in Des Moines, IA. Which of course was a natural fit, given his choice of modified daily driver: his 2017 Subaru WRX. Prior to jumping head first into the high-performance automotive world, Caleb earned his Bachelor of Science degree in Sport Management at Marshall University in Huntington, WV, and then going on to complete a Master of Science degree in Sport Management at NIU in DeKalb, IL. Needless to say, high-performance is in Caleb’s blood, both physically and mechanically. 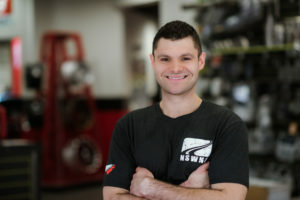 Equipped with a unique combination of both customer service skills & experience, and a passion for all things performance automotive, Caleb is ready to help you turn your dreams into reality!